Thank you for the very earnest review! I will take into consideration your points as I work on my next game. To be honest, with this game, I was much more worried about actually shipping something that resembled a game and performed well on a 486. 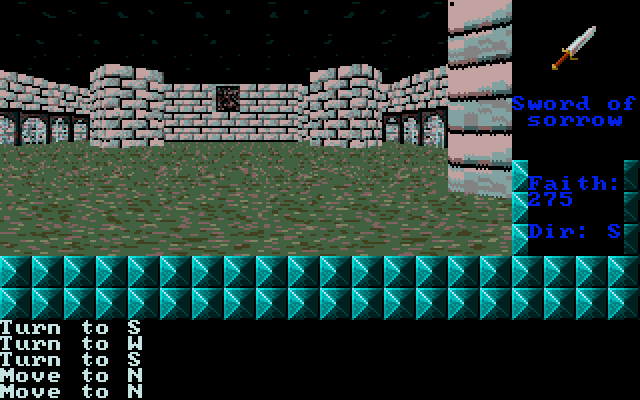 If you strip out the 3D graphics, it’s a pretty basic RPG (casual?). I understand having trouble with interrupts, it can be hard to get hardware interface code right. I tried writing a VESA graphics library once but ran into trouble with the DOS extender and some BIOS calls I had to make. No interrupts involved, but I got bitten by having to give a real mode address to a VESA BIOS call. That didn’t work out well.